Putting in weeks of hard work sticking to a new diet or fitness routine and the scale still won’t budge? Not seeing results despite efforts can be demotivating, and in some cases, heartbreaking. However, before reverting back to old habits, it’s worth examining the top 5 common reasons why you may not be losing weight. If overall weight loss is the goal, it makes sense to rely on the scale to determine success. Tracking body weight changes may provide some insight into progress, but the scale does not tell the whole story. Total body weight is the sum of numerous variables: lean mass (muscle, organs, water), fat mass, and bone mass. Body weight can fluctuate as a result of changes that are unrelated to body fat. Sometimes a change in body weight, or lack thereof, does not reflect the specific body composition transformations that are taking place. For example, if an individual who has adopted a specific diet and fitness plan loses 4 pounds of fat and gains 4 pounds of muscle (we see this all the time), the increase in lean mass offsets the fat loss, and thus produces no overall change in total body weight. 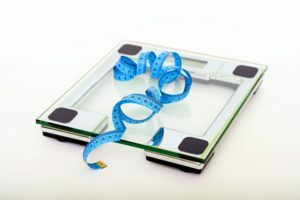 If this person relies only on the scale to measure success, they may feel frustrated thinking they have not lost weight. A generic scale is incapable of capturing what’s truly happening in the body – a measurement of body composition is required. By measuring body composition with a CompID Scan using DEXA (DXA) technology, an individual can compare the amount and location of fat mass and lean tissue mass in their body. While not as reliable as professional testing, it is still possible to track progress using body circumference (girth) measurements and photos. Regardless of method, it is most important to avoid assessing changes in weight using only a scale. While it sounds contradictory, it is possible to pay too much attention to food quality. Being too focused on consuming organic, grass-fed, hormone-free, raw, non-GMO foods may pose a risk of disregarding quantity. According to this equation, one must create a calorie deficit in order to lose weight. This means that for fat loss to occur, one should consume less energy than they burn (note: this is not always as simple as it sounds). Unfortunately, a clean diet alone will not guarantee fat loss. Obviously, the quality foods in a diet plan should not be ignored, but by consistently prioritizing quality over quantity, there is still a risk of overeating calories and gaining weight. Therefore, it is worth considering the number (and types) of calories consumed. Many diets cut out entire food groups or macronutrients. These “elimination diets” may restrict gluten, dairy, sugar, processed foods, carbs, fats, and so on. Elimination diets can technically work, but how one might suspect. For instance, if an individual eliminates gluten and loses 10 pounds over the course of several week, they may attribute the removal of gluten to weight loss and start to believe gluten causes fat gain. These experiences perpetuate the notion that certain foods are to blame for fat gain, but many other factors may be in play. Furthermore, one individual’s success may influence others who attempt a similar lifestyle that may not mirror the same results. Elimination diets are ineffective because there is not necessarily a “culprit” of food causing weight gain or inhibiting fat loss. Fat loss occurs due to a caloric deficit, rather than a food group elimination. Consider again the removal of gluten from a diet. Foods that are high in gluten may also be high in calories and carbohydrates (breads, pastas, pastries). A gluten-free diet inadvertently reduces caloric intake by eliminating these calorie-dense gluten-containing foods once regularly consumed. Unfortunately, elimination diets can cause confusion. In truth, there is no “magic trick” or single food to avoid to promote fat loss. When it comes to losing fat mass, it is important to find a dietary approach that helps maintain a caloric deficit over a sustained period of time. 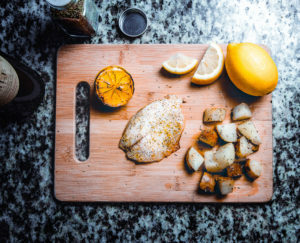 Tracking food intake in an effort to record the number of calories consumed can be effective, but only with a clear understanding of what amount and type of calories is most appropriate based on one’s specific needs and lifestyle. Predictive equations or fitness trackers may not paint the clearest picture. Unfortunately, most online calculators and fitness trackers grossly overestimate the number of calories burned each day. By following misleading guidelines within a tracker or app, it is possible to consume too many calories. If body mass remains constant (not losing or gaining weight), it is likely that calories consumed is resulting in weight maintenance, whereas a slight reduction in calories would result in fat loss. Most predictive equations determine caloric needs based on weight, height, age, gender, and reported activity level to determine total daily energy expenditure. However, there is significant variation from person to person due to genetics, body composition, and lifestyle factors. A better measure of caloric needs is resting metabolic rate (RMR), a measurement calculated by a simple breathing test. Results from an RMR test can better inform what dietary approach should be applied to an individual’s specific needs or goals. To revisit the Energy Balance Equation, there are two variables at play: energy in and energy out. To lose unwanted pounds, manipulating both of these variables can speed up results. Increasing energy expenditure while reducing caloric intake may seem like a logical approach to reach fat loss goals, however, “more” does not always mean “better.” This is especially true when restricting calories, as the body will fight change in an effort to maintain homeostasis (balance). Despite a 6-pack goal, the body’s biggest priority is always survival. Reducing energy (calorie) intake, the body begins to believe food is scarce. Contrary to popular belief, going underfed for a sustained period of time is an ineffective approach to fat loss. Each day the body burns a certain number of calories to perform basic tasks like showering, brushing your teeth, walking, fidgeting, eating, and of course, exercising. The less the body is fed, the less energy it will use to perform these tasks. In essence, eating less will temporarily slow metabolism as the body adapts to lower energy availability. In addition to a down-regulation in metabolism, the body will also increase production of hormones to signal hunger in response to low energy availability. These hormones signal the brain to find food for survival. In this case, frustration around adhering to a restrictive diet may not be due to lack of will power or motivation, but rather a chemical response for survival. It is possible to prevent weight loss or remain in a plateau from substantial down regulation of energy expenditure such that the body will no longer eat in a caloric deficit. Remaining in a loop of extreme restriction followed by extreme hunger and binging can also make it hard to sustain a caloric deficit. “Weight loss” is relative. Consider body composition while making goals to maintain healthy lean mass and lose body fat. In order to lose fat, you must sustain a caloric deficit, regardless of food quality. No foods are inherently good or bad. 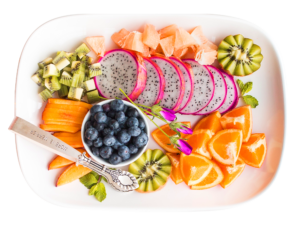 The best healthy diet approach is one that you can stick to indefinitely. Every individual has their own specific caloric needs. Online calculators do not have all the answers. More is not always better when it comes to energy expenditure. Curious to know more about your body composition or resting metabolic rate? Let our team help you on your health journey.